It’s no secret that identified gifted and talented populations are dominated by students from white and Asian American families and that students from African American, Latinx, and Native American families are disproportionately underrepresented. Less well known is the degree of this proportionality at individual schools or school districts. Disproportional representation in any educational service or program cannot be addressed through policy and practice if individual schools don’t know the scope of the problem or how long it’s been going on. Luckily, the data are now available to answer such questions. Since the 2009–10 school year, the Office of Civil Rights (OCR) in the U.S. Department of Education has conducted a biannual survey of every school in the country on a range of civil rights issues. (These data were part of a large Fordham report entitled Is there a Gifted Gap? earlier this year.) Although this data collection has been going on since the late 1960s, what made 2009 a breakthrough year was that all schools were surveyed instead of just a sample. This universal data collection has continued ever since. What this means for practitioners is that information on gifted education service populations is now available for every school and school district in the country. School districts are required by law to participate, and the 2015–16 data collection included more than 96,000 public schools. What’s even more exciting is that the 2015–16 data just recently came available via the OCR school and district search tool on their website. 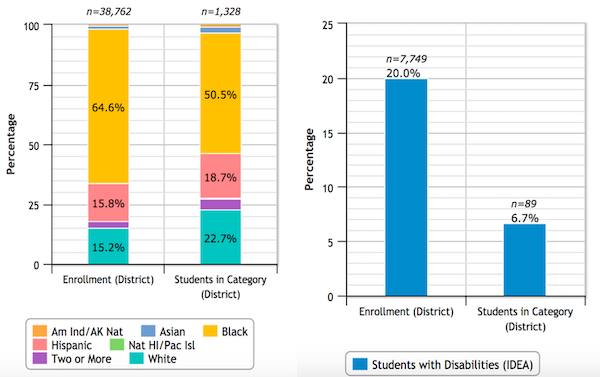 These figures show that some students, such as those served under the Individuals with Disabilities Education Act or who are from African American families, are underrepresented in gifted programs. All schools need to know these data exist—and, more importantly, schools need to use them as a call to action. There are no simple solutions to addressing disproportional representation within gifted education and closing excellence gaps, but only through broad awareness at the individual school and district level can efforts be taken to better meet the advanced learning needs of all students. Scott J. Peters, Ph.D. is an Associate Professor in the Department of Educational Foundations and the Richard and Veronica Telfer Endowed Faculty Fellow of Education at the University of Wisconsin – Whitewater.